TOGETHER WITH 7 ALsS of his sister DR MARION BURT documenting their trip to Canada in 1924 as part of the delegation of the British Association for the Advancement of Science, TOGETHER WITH a wallet of original PHOTOGRAPHS of the trip. Sir Cyril Lodowic Burt. Pioneering educational psychologist. The first psychologist to be knighted. A fine early ALS from Cyril Burt to his father. 4pp. August 16th . The Hotel, Royal Muskoka, Muskoka Lakes, Ontario. "My Dear Father, Thank you very much for your letter. We had a wonderful trip to Niagara. The weather cleared up for the day; though iy has been rather unsettled since. All the people at Toronto send heaps of messages which no doubt Marion is writing. I saw a good deal of Tress. His laboratory is quite a big and wonderful affair - with 'oscilloscopes' and electrical furnaces on a huge scale. Eleanor went back on Monday, but had several weeks with us. I have also been to dinner twice at Aunt Annie's and Marion several times to tea. Aunt Bessie looked very much better the last day or two. I think the journey from Elm Vale may have tired her; for at first she looked almost the Grandmother of the party. Also she has since got a new ear trumpet which is a comfort to her. Aunt Annie, however, is the youthful one. Mrs Tress I didn't not [sic] see very much of of. But the babies are charming. Our trip here through the Moskoka lakes was very delightful. And this is the most restful and beautiful spot. I don't whether [sic] to call a thousand islands among the three lakes or a thousand lakes among the islands and rocks of the mainland. The three lakes themselves (Muskoka, Joseph and Rosseau) are rather like the Scottish lakes: but far more cut up. Also there is just the slight difference that makes everything a little more entertaining here - the trees, the wild flowers, the birds and the scenery generally - all are recognisable but have a sort of luxuriant turn or colour. Today it's a little damp here and certainly not cold, though it is said to be nearly 1,000 feet above sea-level. Anyway, it's not hot! I must break off for dinner. I hope you are all keeping well. With much love to you both. Your affectionate son, Cyril B." 8vo. Some slight creasing, else fine. 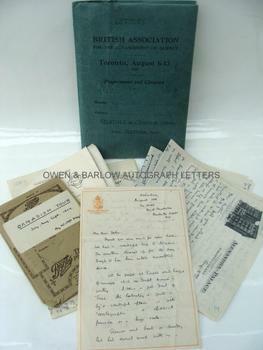 Together with 7 fine, long ALsS (39pp) from MARION BURT to her and Cyril's parents and a wallet of original photographs of Cyril Burt, Marion and others, taken during the trip. In 1924 Cyril Burt and his sister, Dr Marion Burt, were part of the delegation of the British Association for the Advancement of Science that attended meetings and a series of lectures given at the University of Totonto, where Cyril Burt delivered a paper. They combined the trip with visits to relatives in Canada and a general round of sightseeing. Other members of the British delegation (and travelling companions of the Burts) included the psychologist and pioneering psychoanalyst, John Carl Flugel and his wife, the psychologist Tom Hatherley Pear and others. Cyril's letter to his parents is in his rather self-consciously formal style but Marion's letters, written in the form of an amusing and fact-filled daily diary, document the entire trip in detail. They include accounts of the sea crossing, fog, icebergs and a burial at sea ("One of the immigrants died in the night and is to be buried at sea this afternoon. Ludwig [Cyril] nosed that out of course - he does everything and knows the children by Christian name and intelligence quotient! "), their views in the Flugels (which are not always very complimentary), Cyril's lecture at the university, the university facilities and laboratories, meetings and discussions with other psychologists, visits to relatives, sightseeing around Toronto, their stay in New York, the return trip during which they made friends on board ship with the heavyweight boxing champion, Georges Carpentier, etc., etc. 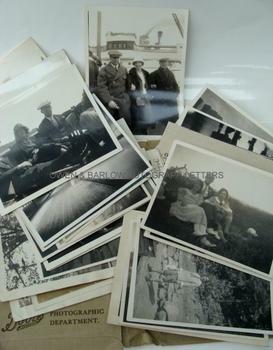 The photographs are captioned on the versos with names of persons shown, etc, and include many photographs of Cyril Burt and Marion Burt, taken on board ship, on university campus and other locations. There are also photographs of the Flugels, other members of the delegation, the boxer Georges Carpentier, etc. Many of the photographs were taken by the Flugels and others by Cyril and Marion Burt. A rich unpublished source of material for those interested in the life and career of this controversial scientist. Sir Cyril Burt was the first educational psychologist and is probably still the best known. He is most famous for his work in the field of eugenics and for his studies of twins and the heritability of IQ. In 1913, Cyril Burt was appointed as the first school psychologist for the London County Council, with the responsibility for picking out the 'feeble-minded' children, in accordance with the Mental Deficiency Act of 1913. During this time, he notably established that girls were equal to boys in general intelligence. His 1925 book 'The Young Delinquent' led to the opening of the London Child Guidance Clinic in Islington in 1927. He is also credited with pioneering the 'eleven plus' examination system. The work of Cyril Burt in eugenics was the chief influence on Hans Eysenck and others. Shortly after he died, however, his studies of inheritance and intelligence came into disrepute after evidence emerged suggesting he may have falsified data (the 'Burt Affair'). Scholars have since asserted that there is no evidence to support the suggestion that Cyril Burt committed an intentional fraud and, in general, his reputation as the first and most influential of educational psychologists is now fully restored. From the studio archive of Catherine Moody and her father, the artist Victor Hume Moody, successive principals of the Malvern School of Art. The Moody's were near neighbours and friends of the Burt family and Cyril's sister, Dr Marion Burt, practiced as a GP in the area around Malvern. Cyril Burt, as a boy, had lived in Snitterfield, a village about 30 mikes from Malvern, where his father was an apothecary before becoming a medical practitioner. His mother and sister subsequently settled in Malvern. The two families appear to have had quite close ties (possibly they were related) and Catherine Moody cared for Marion Burt in her final illness. Marion Burt never married and, after her death, a quantity of her personal papers, including these documents, were retained by Catherine Moody.